"Kim is suddenly adrift in an expensive foreign city with a child to support. She's been trailing dutifully around the world with her unreliable husband Richard ... but early one morning he is reported killed in a plane crash ... His shady employers insist she must leave the company-rented house within a month and, with no home in England, she finds herself destitute. Then wicked old Henri makes a practical proposition. What would you do if you were Kim? How would you cope with the extraordinary dilemmas she faces?" ... on wherever it wants to go! Passing to Caroline080 at the Kings Heath Kitchen Garden Cafe mini-meet on Saturday. Received last night from WyldeTwo in Jyoti (south Indian vegetarian restaurant) Stratford Road. Birmingham Bookcrossers have had three meetups this week, so the book was bound to find me somewhere! I have this back temporarily - will send on to LindyLouMac next weekend. Arrived today with an interesting postcard for my study wall, thanks LyzzyBee. A couple of titles ahead of this but should be able to read next week. Update 18/04/07: This is brilliant I am racing through it! Spent the afternoon in the garden reading, as could not put it down! Forty pages to go then I will review properly. I have contacted next on the list today for an address. A really enjoyable read. Once I started I just could not put this book down, two sessions sitting in the sunshine in the garden after lunch on Tuesday and Wednesday and it was finished. The characters are very realistic as is the authors writing style. So much is obviously taken from her own 'life experiences' as some of her comments about places etc that I also know of personally are just so true! For instance about 'the coldest car park in the world' and her comments on BBC Prime. I laughed out loud as I know the car park well and I watch BBC Prime. The story has all the traditional elements of a romantic novel, but it manages to convey so much more with humour, suspense and intrigue all included. I look forward to reading more from Susie Vereker, starting with her first novel Pond Lane and Paris, which I have not had a chance to read yet. A copy is on its way to me as I write! I will certainly be recommending this novel, author and transita yet again to friends and family. En route to Mallary. It took a couple of attempts for address to reach me via the PM system. Arrived today, many thanks for sending it so promptly. Another excellent Transita novel. I want to visit Switzerland now! It probably says too much about me but the part that affected me the most was when their dog was kidnapped. I was desperate for them to get him back. UPDATE: Posted 06/06/07 to Nice-Cup-of-Tea...enjoy!! Arrived safely this morning, thank you nice-cup-of-tea. I'm reading another couple of ring books at the moment & then I will get to this one. A great read, I liked the characters, the setting, the romance & the mystery. Thank you LyzzyBee for the chance to read the book. I Hvae LindyB28's details & will get this on it's way again asap. Thanks for sending this to me Audrey. I read a bit of it over the weekend and came to the conclusion that there are too many good books out there waiting to be read for me to spend any more time reading this one. I found the situation and prose clunky, and while it might improve over the course of the novel, I'm afraid I'm not that eager to find out. I'll PM Birmingham-Rose to get the book to her. Sorry for being negative. I've just read the journal entries and realise that without exception, everyone else has enjoyed it! Aaaaarrrgggghhhhh another one arrived in the mail. I'm being bombarded by rings and rays again, just when you think you've got the chance to read another book from Mount TBR the postman knocks the door!!! FAO Birmingham-Rose - I haven't heard from you since January when you said you'd be sending the book on. I haven't had any response to an email and PM about another matter (Linda Gillard trying to contact you) so I hope you're OK. Are you able to return this book to me so it can travel onwards? Just need to know so I can move the other readers on to another ring if necessary. I'VE FOUND IT!!! WAHOO!!! Sorry for the hold-up!! It got lost amongst several other books. This will be next on my reading list and I will then send it on as necessary!! Whew!!! What a busy couple of weeks I have had catching up with the books that I very wrongly held up. Anyway the good news is that I have finished with this book and will be PM'ing PurpleRoseBud to send it on its merry way. I found this book to be interesting with some wonderful descriptions and an overall winning plot. It wasn't one of my favourites but enjoyable none the less. This was mailed to Mary by 2nd class post yesterday (Wednesday). Hope you receive it soon. Arrived over the week-end. Many thanks! I have 1 & 1/2 books to read first but when I see calalilly I will ask her if she wants it first. Sorry but I'm afraid I didn't find this book as enjoyable as most of the previous readers. I liked the setting but not much else. I didn't find the characters believable, although I could imagine someone finding themselves in the situation Kim found herself in, taking Henri up on his offer. Will be passing on to calalilly very soon. Passed onto me by Purplerosebud when we met up for coffee and a chat at a garden entre. I've got a couple of other books to read first and then I will start this one. Sorry Lyzzybee I put this aside to do the journal after I'd finished reading it and put it in the wrong pile and have just discovered it. An easy to read book that didn't take me long to get through. Awaiting the address of Sally906 and then it will be winging its way to Australia. Arrived today in the mail-box. I enjoy Transita publications (now sadly defunct) and read them whenever I can get my hands on them. To say that ‘An Old-Fashioned Arrangement is Chick Lit is a bit of an insult to the author – it is really much more than that. There is romance, suspense, humour and pathos. And then there is the moral dilemma of the main character, Kim. Kim is married to Richard – who is a bit dodgy. They often have to leave a country in a hurry as his underhanded schemes get discovered. As the story opens they are in Geneva, and it looks like Richard is up to no good once more. Only this time he is believed to be dead – he was on a plane that crashed in Indonesia. Kim is in dire straits – Richard has cleaned out their accounts, and his employers have told her to move out of the company apartment. No money, no job and a twelve year old son in a private school. What it the new widow to do? Enter Henri the apartment owner. He has admired Kim for a while and he offers her an alternative, to be his mistress. All she is expected to do is sleep with him on Thursday nights. Kim likes Henri but this is something quiet different. When push comes to shove and she realises there is no other source of income she takes him up on his offer. Now many would sneer at her decision, but none of us are perfect, and a mother does what she can to protect her child. Kim comes over as a very believable character, she starts off as a very gullable, weak and dependent woman but shows that she is made of sterner stuff by the end of the book. Different drama’s get thrown at her – the death of Richard is just the first – but she overcomes all obstacles in her search for a secure life and loving relationship. I do like the way the author has given us a heroine that is mature, not afraid to cry, ready to laugh, looking for love and above all protects her child. She has spent her married life putting husband first, surely now it is time to put herself first? 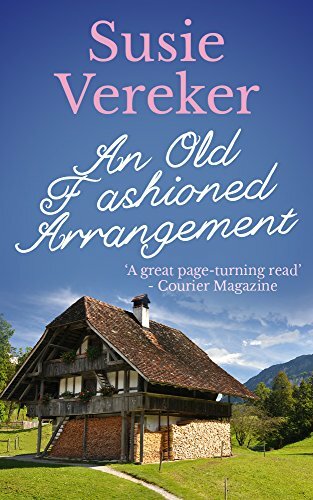 Suzie Vereker has written other books – will keep my eye out for them. This book is being sent on to 'Ms January' for the Southern Cross bookcrossing exchange. Sally906 sent me this book for January Southern Cross Exchange. Thank You!